Prime Minister Ahmet Davutoglu said that his country intends to protect Syrian Aleppo, calling it a settling of a historic debt. Last week the official representative of the Ministry of Defense of Russia, Major-General Igor Konashenkov, said that there are serious grounds to suspect Turkey of preparing a military intervention in Syria. According to him, the Defense Ministry presented the international community with irrefutable video evidence, of which Turkish self-propelled artillery is firing on Syrian villages in the North of Latakia. President Recep Tayyip Erdogan has called the allegations “ludicrous”. “We’ll pay our historic debt. Once our brothers from Aleppo defended our cities: Şanlıurfa, Gaziantep, Kahramanmaras (during the First world war — ed. ), now we will protect the heroic Aleppo. Behind her are the defenders of the whole of Turkey,” said Davutoğlu, speaking at a meeting of the parliamentary faction headed by the ruling Party of Justice and Development. Last week the Syrian military cut off major supply routes of terrorists in the Northern province of Aleppo, leading from Turkey. 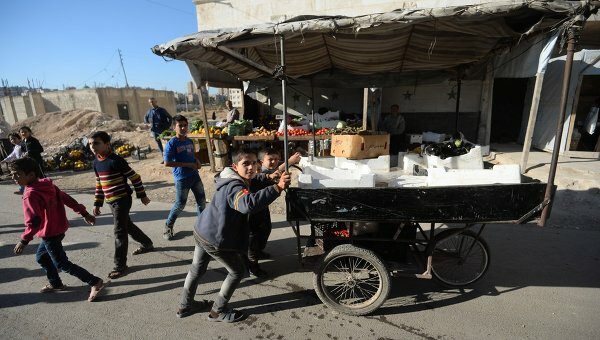 After that, troops, with the support of the militias, and Russian air force managed to break through the blockade of four towns Nubl and Al-Zahraa, where the siege affected about 70 thousand inhabitants. Davutoglu once again accused the Russian airforce of “bombing the civilian population”, the continuation of which, according to him, will cause 70 thousand new refugees to arrive in Turkey.